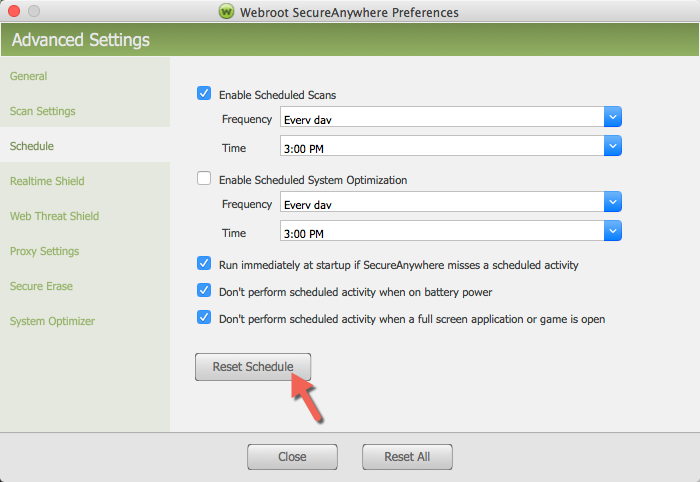 Webroot does not scan at set time i've set up through settings. It appears to scan when computer is taken out of sleep mode. It will also open several scans per day. Perhaps that's due to the setting" scan on bootup if the computer is off at the scheduled time". I am unsure wether WSA has the capability to bring your machine out of sleep mode just to scan it. To me it sounds logic that the scan happens after you bring it out of sleep mode when the machine was at sleep at the time of the scheduled scan... But perhaps one of the experts here can explain it better. and let us know what your settings are especially in the case of the ones that I have boxed in RED. We should be able to tell from that why what is happening is happening. This is how mine is setup as I want it to scan at 1PM daily and no other time also I see the Scan screen pop-up when it does! LOL yours is a Mac version so I will ping ? our Mac expert! Sorry about that Daniel! I thought I mentioned that my original thread... Thanks for your help though. Have a great day! I have the same setup that you have. Have you tried the Reset Schedule? 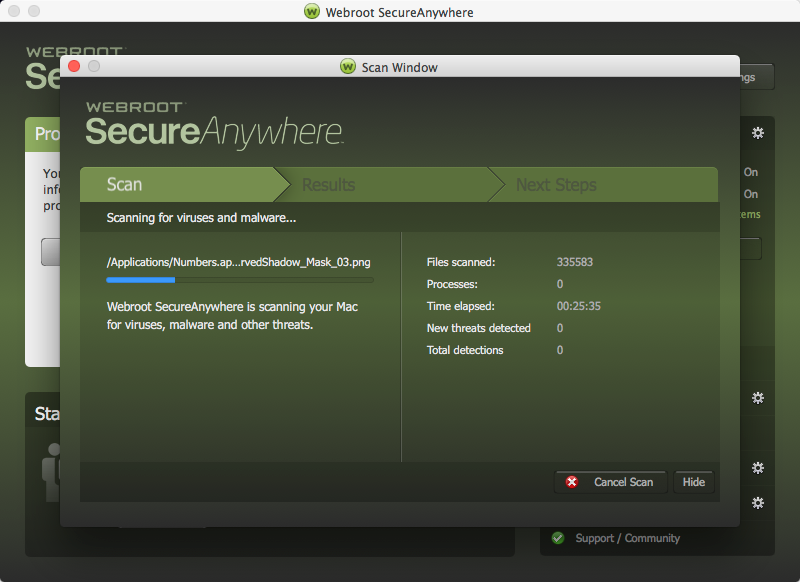 My Webroot on my Mac will scan upon boot up. And if I don't reboot which I hardly do reboot. It will scan at 3:00 PM. I do not have an issue with scanning after my Mac awakes from sleep. 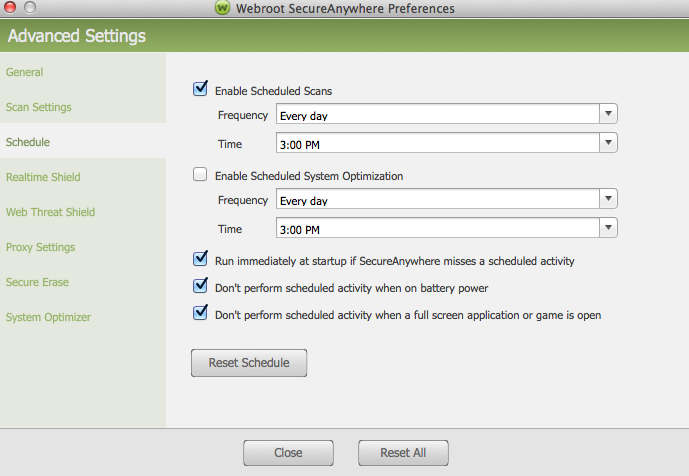 I can't tell you why Webroot scans after sleep mode. and not at a scheduled time. 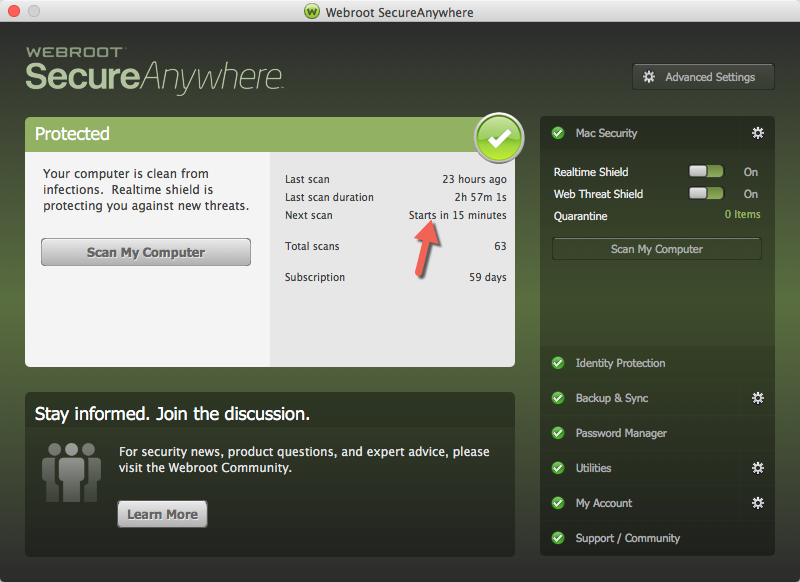 My Webroot is scanning now at 3 PM. 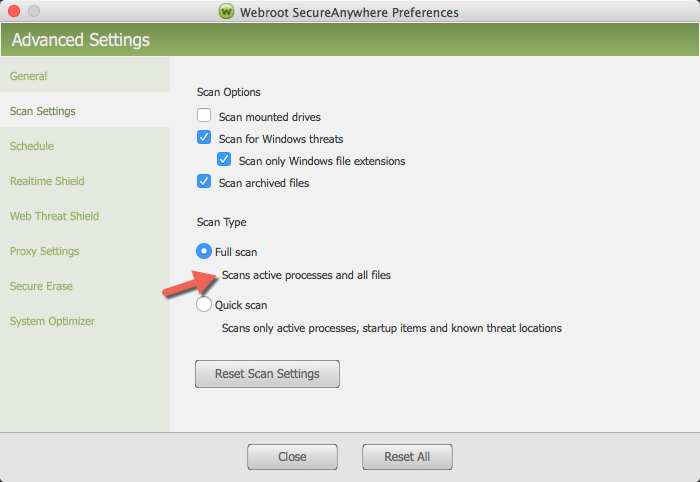 I would say that you could Submit a Suupport Ticket and they will have a look for free of charge beecause Webroot shouldn't be scanning that many times. At least mine doesn't.. I don't know if a uninstall/clean reinstall would fix this. Hoped I helped out somewhat. Yes you are right Daniel but I did reboot around then...so not sure am I? I am not aware that my system scans that many times. I am usuallly on standby alot through the day. So I do have a long scanning time..don't I? 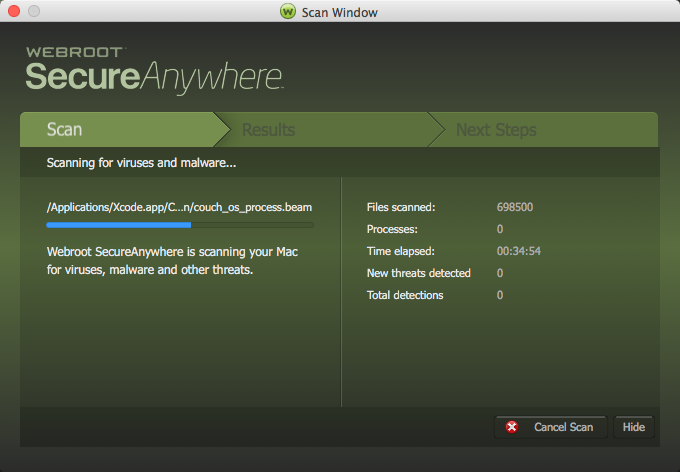 WoW that's a longtime or does the Mac version scan the whole drive every time? Maybe @Wanderingbug can give us some incite? Here about 25 to 40 seconds. Yeppers. Alienware 17R2 Laptop with 5 SSD's. I've always have a Full Scan..
About another 35 minutes maybe this scan will be done! 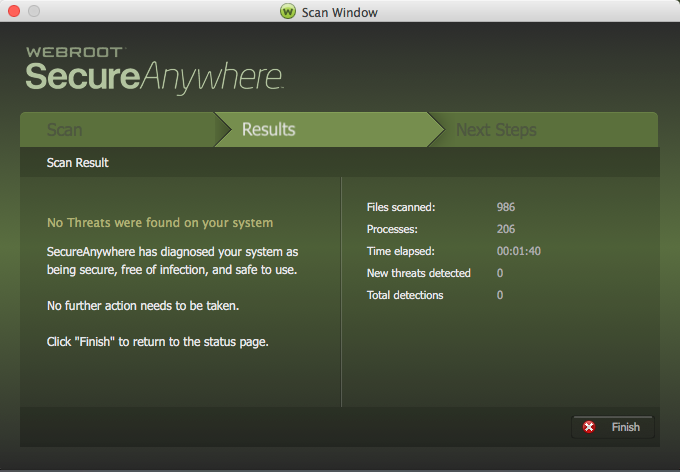 All you need is a Quick Scan as they call it on a MAC version it's the same as a Default Deep Scan for PC's. 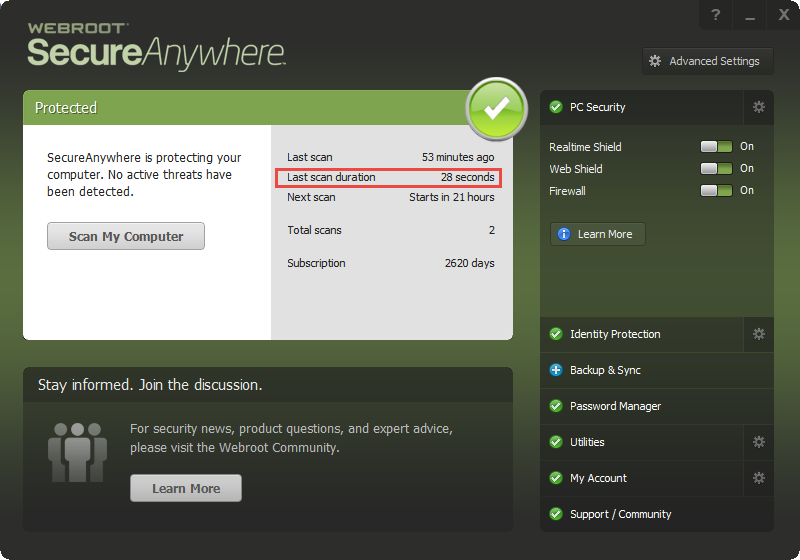 Because WSA's Realtime Shield is always active and watching your system. Okay I'll do a Quick scan and see how fast it goes! 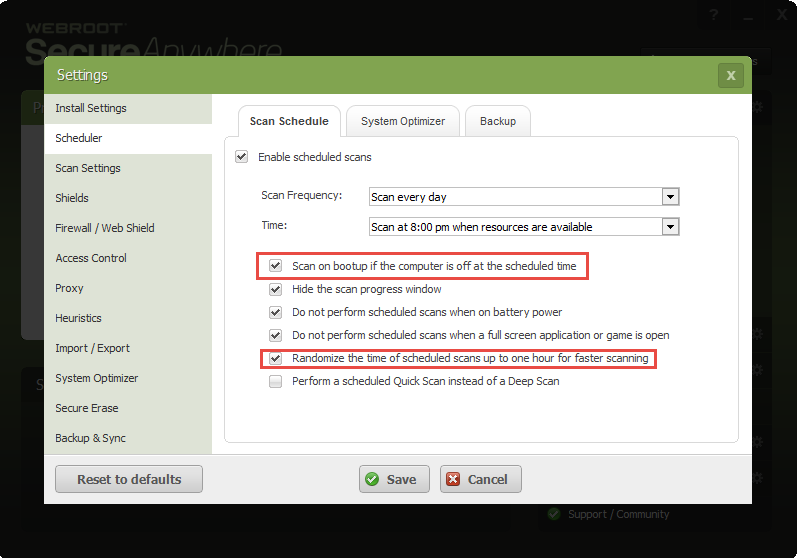 If your computer is in sleep mode or off during the scheduled scan time then it will not scan untill it is brought out of sleep mode. This could be due to a few things, if the system was scanning and you your put it to sleep the timer will continue to count but the scan will stop until the system is relaunched. It could also happen if there are backups or external drives set to scan. Without running MacLogs I wouldnt know exactly what is going on.